Perfect Laser, the first domestic manufacturer of automatic laser carving machine. PEDK-13090A auto feeding laser carving machine is developed by Perfect Laser for Co2 laser cutting and engraving of long-processed workpieces such as fabrics, leathers and carpets. Equipped with an automatic reeling system, the entire fabric can be processed at one time, eliminating the need for manual intervention in the middle and saving time. 1. The auto feeding Co2 laser cutting machine is equipped with an automatic coiling system, which can be used to process and complete the entire cloth. It is especially suitable for processing particularly long workpieces such as cloth, leather, and blankets. 2. The automatic laser cutting machine for fabric is equipped with a thick crawler type workbench to ensure that the processing material is smoothly pushed during the processing to ensure the smooth movement of the processing material and no manual adjustment is required. 3. 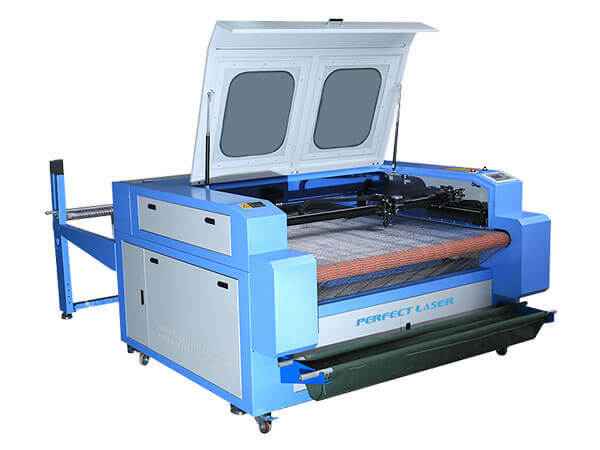 The laser fabric cutting machine adopts imported high-precision linear guide system and professional lenses to ensure the quality of the optical path, ban on long-term durability, dust-proof lubrication, improve the quality of engraving, and extend the service life of the laser carving machine. 4. 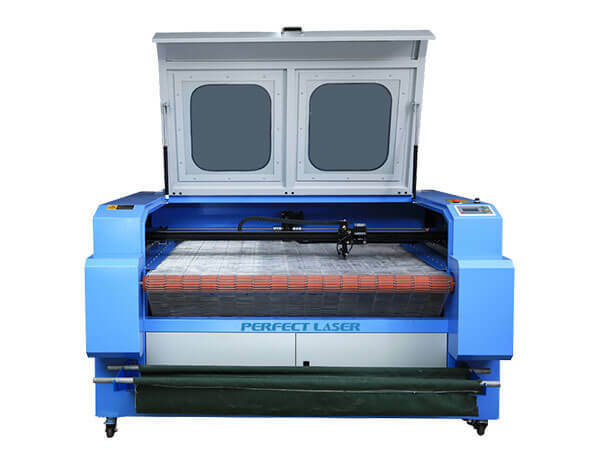 Perfect Laser's independent research and development control systems of the laser carving machine, special for cloth, leather, blanket cutting sculpture design, with high compatibility, support for any computer operating system, you can set a variety of parameters. 5. High-speed stepping drive, the laser intensity output power of the laser cutting machine for fabric is controlled by the analog quantity, the error is small, the repetition precision of 0.0125mm, laser carving machine can perfectly engrave the 1X1 millimeter English alphabet. 1.Applicable materials: Co2 laser cutting machine is widely applied in plexiglass, MDF, crystal, PVC plastic, paper, acrylic, wood, textile, fabrics, fabrics, leather, EVA materials, bamboo, sealing strips, rubber sheets, marble, granite, ceramics, etc. 2.Applicable industries: Co2 laser cutting machine is widely applied in advertising, crafts, machinery, automobiles, electronics, toys, and in the trade mark, embroidery, clothing and other industries.